If you are a major gold making Jewelcrafter odds are you've probably heard of the OreCrusher 2 Addon. If you don't use it I highly suggest downloading it and trying it out. OreCrusher 2 just got a SERIOUS facelift that made it infinitely more useful! OreCrusher 2 (OC for short) is an in game spread sheet that calculates how much profit you can make if you maximize your prospecting potential. 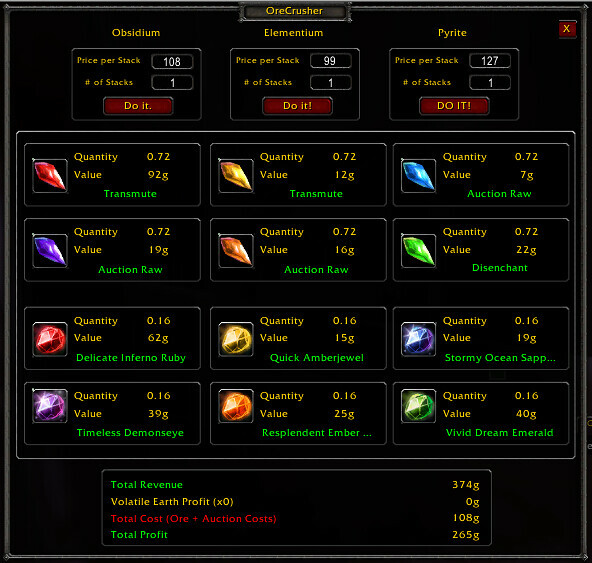 It pulls values from Auctionator, Auctioneer, or TSM and calculates the maximum profit (on average) that you can make from prospecting each major type of ore. A screenshot example for Elementium Ore is below(type /oc in game to bring up this window). Now, they may look like Wrath gems, but the prices are in reference to Cata commons and rares. The quantity is from Elementium Ore average prospecting rates, as I chose it for this example. Not only does this addon tell you that your total profit will be 265 gold for 1 stack of Elementium Ore, it also tells you what to do with your commons (Transmute, Auction Raw, or DE). It also suggests cuts for your rare gems! To see how much profit you'd make with 2 stacks, change the # of stacks to 2 and hit the "DO IT!" button. I can't stress how impressed I am with the added functionality of this spreadsheet addon. I now consider this to be a necessity for any good Jewelcrafter. If you mouse over the suggestions for the common gems, it will tell you the values it used for comparison for the alternatives. The best way to learn about this addon is to use it in practice, so stop reading, go download it, and get using it now! Give Your Competitors the Rod!! Are you Using Your Extra Justice Points Wisely?